While tooth brushing, proper oral hygiene practices and regular dental checkups play an important role in preventing dental health problems like gingivitis, it is equally important to take a balanced diet that is rich in essential nutrients for preventing the condition. Did you know that a deficiency of vitamin C in your body may cause the gums to bleed, which if not treated on time, takes the form of gum infection? Vitamin C isn’t only important for helping your body maintain as well as repair teeth, but it also helps in strengthening cartilage and bones. 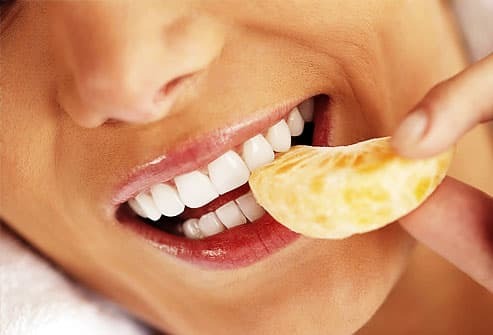 If you have the problem of bleeding gums, you should seriously consider having nutritious foods while making sure that your body is consuming sufficient amount of vitamin C. Apart from supplements and multivitamins, the natural sources of Vitamin C are vegetables like carrots, red peppers, sweet potatoes and of course, the most obvious source of vitamin C i.e. oranges and other citrus fruits. Whether you decide to take supplements or consider eating vegetables and fruits to prevent vitamin C deficiency, it is important to note that packaged juices aren’t an ideal alternative to these sources as a majority of juices contain high sugar content and are extremely acidic, which is something that contributes to tooth enamel erosion.